Battling lunchtime boredom is a real issue with me. I want to eat something that is fresh, healthy, low in calories and low in refined carbs. It needs to be easily transportable, and cant’t take too much prep time in the morning. That often leaves me tied to my desk with a lackluster salad, or a bowl of Greek yogurt. Until now. See how it went so beautifully with the pile of books on my desk? This salad combination awakened all of my senses: It’s rich autumnal colors made it beautiful to behold. The flavors are a unique combination of sweet, salty, and slightly bitter. The textures range from crisp to soft and succulently juicy. 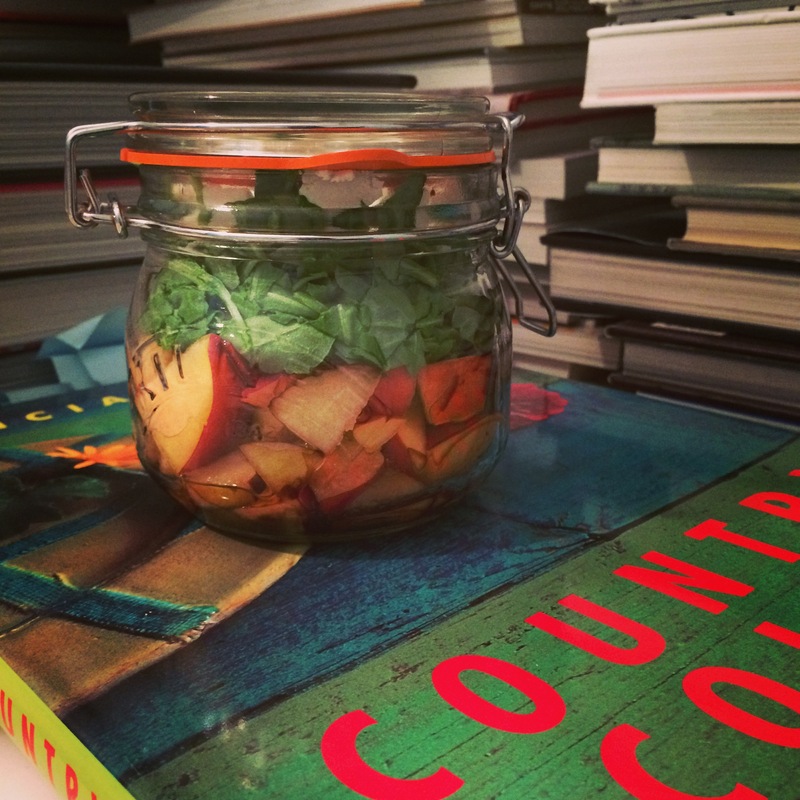 It was ready in minutes and fit perfectly into a compact mason jar, dressing and all! In a word, perfection. In the bottom of a mason jar, drizzle a little bit of olive oil and aged balsamic vinegar. The balsamic vinegar that has been aged 10 years or more has an almost syrup-like consistency, and tends to be much sweeter than regular balsamic. If you don’t have it, no worries, just use the regular kind, and adjust the quantity accordingly. ( You will want a bit more.) Next add a few big handfuls of baby arugula, and pack it in tightly. 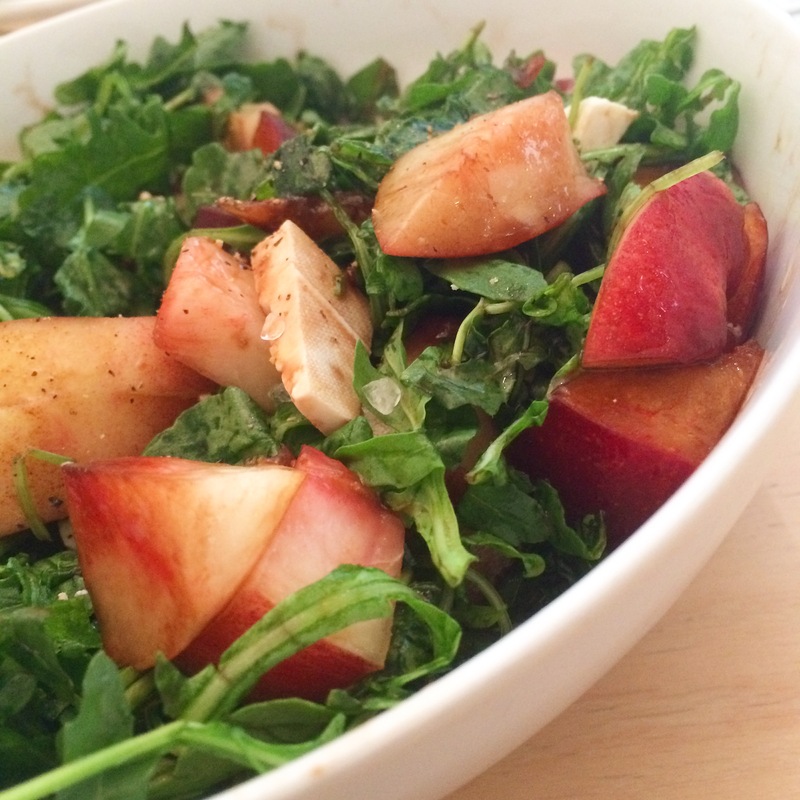 Core and chop the stone fruit of your choice ( I have been using nectarines and plums) and put it on top of the arugula. Lastly, add some diced ricotta salata cheese and seal the jar. You can substitute feta, goat or even mozzarella cheese if you prefer. For a little more crunch, add a sprinkling of chopped nuts. 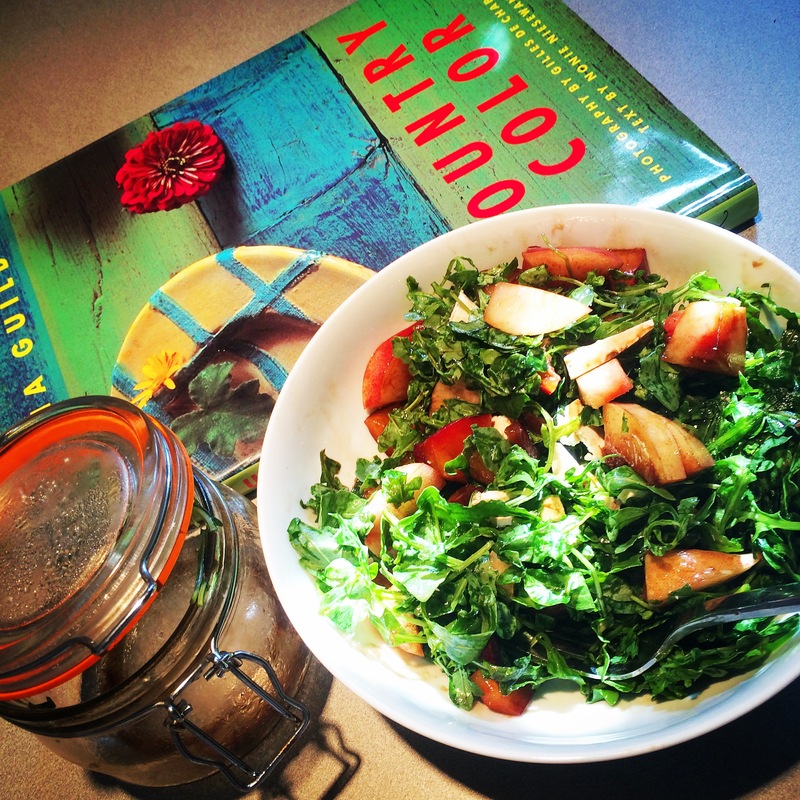 When you are ready to eat the salad, shake the jar to mix the dressing in, pour it into a bowl and enjoy! This entry was posted on September 15, 2014 at 6:51 am and is filed under Food. You can follow any responses to this entry through the RSS 2.0 feed. You can leave a response, or trackback from your own site.